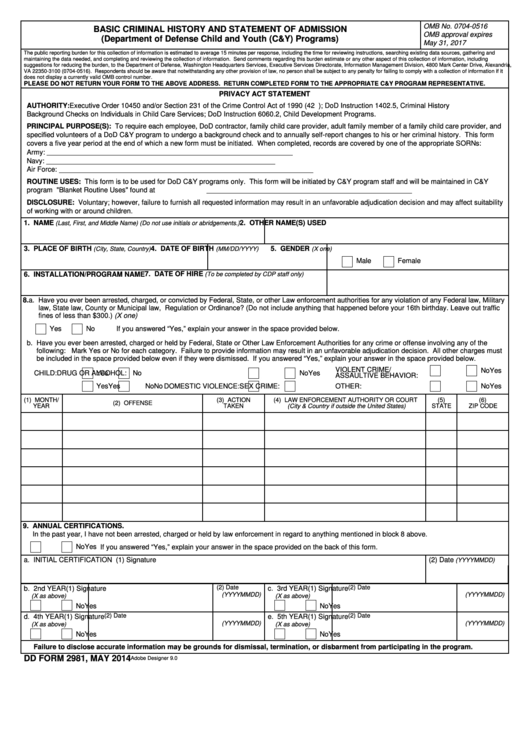 Download a blank fillable Dd Form 2981 - Defense Technical Information Center in PDF format just by clicking the "DOWNLOAD PDF" button. Complete Dd Form 2981 - Defense Technical Information Center with your personal data - all interactive fields are highlighted in places where you should type, access drop-down lists or select multiple-choice options. PLEASE DO NOT RETURN YOUR FORM TO THE ABOVE ADDRESS. RETURN COMPLETED FORM TO THE APPROPRIATE C&Y PROGRAM REPRESENTATIVE. Background Checks on Individuals in Child Care Services; DoD Instruction 6060.2, Child Development Programs. program offices.The DoD "Blanket Routine Uses" found at may apply to these records. of working with or around children. If you answered “Yes,” explain your answer in the space provided below. be included in the space provided below even if they were dismissed. If you answered “Yes,” explain your answer in the space provided below. In the past year, I have not been arrested, charged or held by law enforcement in regard to anything mentioned in block 8 above. If you answered “Yes,” explain your answer in the space provided on the back of this form. Failure to disclose accurate information may be grounds for dismissal, termination, or disbarment from participating in the program.